This 15 ounce glass tea mug holds a stainless steel deep infuser, perfect for loose leaf tea. Simply place the loose tea inside the diffuser, pour hot water and let it steep. The end result is a soothing mug of hot tea made just for your friend or loved one. One Glass Tea Mug with Stainless Steel Deep Infuser. Complimentary Engraving on Glass Surface. Free Engraving! Select one initial to be sandblasted on glass surface. Enter information to be engraved using the personalization option during checkout. Gift Box Measures 8" x 5" x 4". 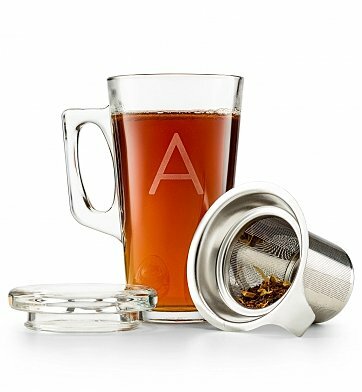 Personalized Tea Glass with Infuser is a hand delivered gift. These gifts are delivered by one of our local design centers located throughout the United States and Canada. Same day delivery is available for most gifts when ordered before the cutoff time. The cutoff time for Personalized Tea Glass with Infuser is 2 PM in the recipient's time zone. Glass tea mug with deep infuser, perfect for loose leaf gourmet tea. Complimentary engraving of your chosen initial on the glass surface.